Dr Jengo's World: Evolve has a new Game Mode! 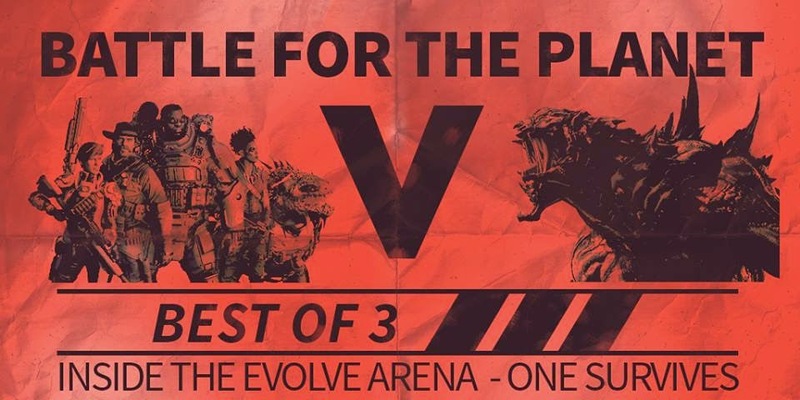 Arena Mode is the new Game Mode that has come for Evolve. Do note that it 'has come' rather than 'is coming'.. The free update was already in the latest patch as it was being announced live on last night's stream..
Basically, you start out in a deployed Mobile Arena where the Hunters will fight against a Level 2, Monster with Half-Armour. The battle goes on until 1 side loses. The Mobile Arena doesn't go down so it's a fight to the finish. Each match is a 'Best-of-3' where you are randomly dropped into one of 5 domes in any of the 14 maps. For the full details, check it out here. Kind of a surprising move, since the game was all about the Hunt. The chase, the tactics etc.. Now, they take out the Hunt and focus on just the fight. On first look, a lot of the skills looks like they will be useless now. For example, Caira's Acceleration Field, Bucket's Flying UAV, some of the Trappers' tracking skills.. While other skills might become a little more important. Gonna be interesting to see peoples' new favourites in this mode. As for the Monster, it's going to be a bit less stressful now I guess. The pressure of having to run and hide is gone. It's going to be a test of how you fight now. I'm definitely eager to try this out.. And it's great that this comes as a free update for everyone. Oh and they did mention there will be a 5th Monster but that's not ready yet unfortunately..